New York, NY – January 20, 2017 – Iconic, trailblazing rocker PAT BENATAR has joined forces with producer, songwriter and artist LINDA PERRY to release “SHINE” – Benatar’s first new song in over a decade, as part of the SHINE TOGETHER movement to affect positive change in government and the world. Created in support of the Women’s March on Washington, SHINE TOGETHER is a movement that uses the universal language of song to inspire women to support each other and continue to move forward on issues affecting women of all races, ethnicities and backgrounds. SHINE is available January 20 at www.ShineTogether.info and via major music platforms including iTunes, Google and Amazon. The song is priced at .69 cents to draw attention to the gender wage gap of women making less cents on the dollar compared to men. All proceeds will go to the B.A. Rudolph Foundation supporting women pursuing careers in public service and government. The website will include an interactive 'Shine Together Chain' where people can send a 'Shine' to the women that inspire them - an acknowledgment of inspiration, support, genius, or generosity from another woman. Each link in the chain will be clickable and viewable by other visitors. SHINE TOGETHER was concepted by PAT BENATAR, who broke barriers as a female musician and has influenced generations of artists, and TRICIA CLARKE-STONE, Co-Founder & CEO of Narrative_, and a tech, innovation, and marketing leader. 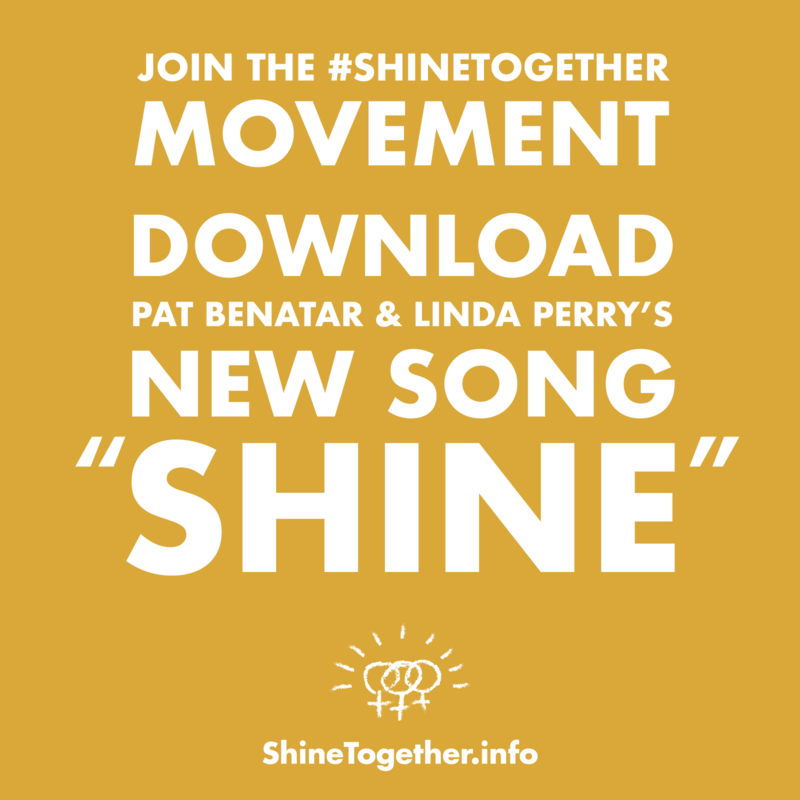 The “Shine” song credits go to BENATAR and LINDA PERRY, an activist, artist, and producer, leading the charge to organize and empower women to stand together. Joining them on the production of the song is producer, guitarist, songwriter, NEIL GIRALDO, a lifelong advocate for women’s rights and creator of the Benatar/Giraldo sound.